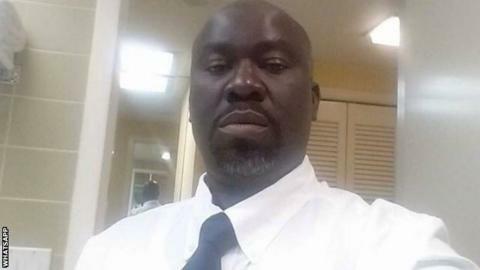 Ibrahim Abubakar's killing has been described as "shocking, devastating and tragic"
Nigerian football official Ibrahim Abubakar has been shot dead by armed robbers at his house in Abuja on Wednesday. Abubakar was head of protocol for the country's football federation. Former Arsenal striker Nwankwo Kanu has described Abubakar's death as "bad and sad news" on social media. Local media have reported that Abubakar is survived by his wife and three children. He will be buried in Kaduna in the north-west of the country. The Super Eagles media officer Oluwatoyin Ibitoye said the killing was "shocking, devastating and tragic". Nigeria play a warm-up match for the African Nations Championship against Angola in the South African city of Pretoria at on Wednesday. The game will be behind closed doors at the request of the organisers.